The Toscan is one of the oldest ships in the galaxy. 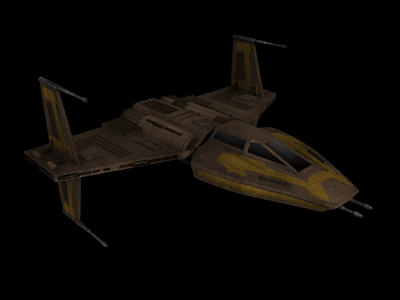 Created before the start of the Clone Wars, the idea was to create a ship so powerful it could take out any fighter that came at it without manoeuvering. This ship has the hull strength of a light freighter and the weapons load of a Skipray Blastboat making it one of the most deadly ships around. With most of its space focused on weaponry, the engines are slower than almost every ship making it vulnerable to fast interceptors who can dodge the heavy incoming fire. 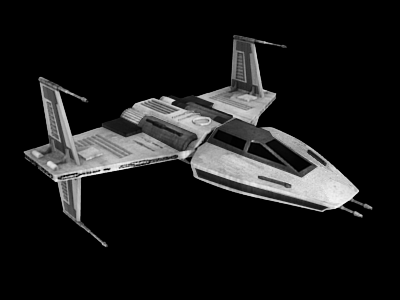 This is the predecessor of the famed Y-Wing and the V-Wing as evident in the shape of the cockpit and the wings. With a minimal sensor package and no astromech space this fighter has seen less and less use throughout the galaxy despite the large payload it can carry. The Toscan sports heavy bomber weaponry in the form of concussion missile launchers for corvettes and freighters as well as Ion cannons and lasers for fighter defence. While rare these days they are still a force to be feared and can often be seen among heavily armed pirate raiding parties.